Snacking when used right can be a good way to reduce the amount you consume at your main meal. But when you overindulge and eat calorie-heavy food that are full of sugar, carbs and fat, you can easily increase your weight in a matter of weeks. Here are a few ways to make your snacks worthwhile and help you stay on track with your weight. Put it on a plate – When you snack out of a box or a bag, you will tend to eat mindlessly. Look at placing a small option on a plate and stick to one serving. 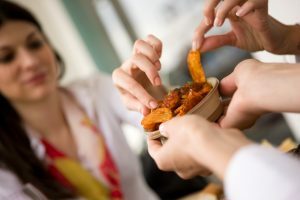 Take a seat – Snacking is often done standing, walking around or eating while multi-tasking, which means that once you’re done snacking, you hardly remember eating at all. Instead, sit down and concentrate on what you are eating, increasing satisfaction and the feeling of fullness. Make it balanced – Choose a snack that gives you some carbs, protein and fat, to maintain your energy and keep you full for longer. Slow down – Eating fast will not leave you satisfied because your brain will not have enough time to tell you that you are full. Look at consuming your snack slowly and enjoying every bite. Eat regular meals – If you find it hard to go an hour or two after meals without a snack, your meals are not satisfying you. Make sure your main meals include, protein, fiber, and fat which will slow digestion and reduce the need to snack.